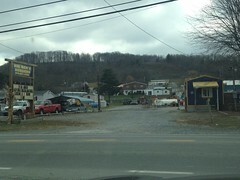 The infamous Grillbilly's has gone the way of the Dodo. 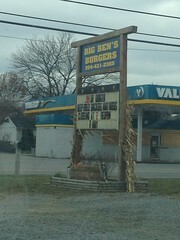 In its place, in that little blue trailer, is Big Ben's Burgers. If you recall, I actually really enjoyed Grillbilly's - though not the epitome of creative culinary excellence - it is a nice little shack that put out some tasty food. 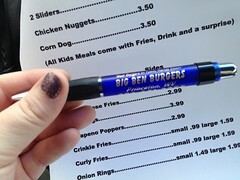 So, when I saw that it was replaced by Big Ben's Burgers, I wasn't hesitant to give it another go. This time, though, I was flying solo, so I tried the drive-thru. It's awkward in that there isn't a place to loop around, so I drove up through their parking lot, turned around, then went through the drive-thru. 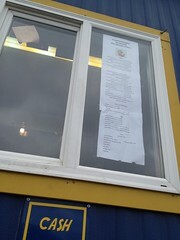 From my car, I was staring up at the menu when the doors slid open. The man working asked me if I had been there or had a menu. I said no, and he handed me a stapled menu and a pen! Score! 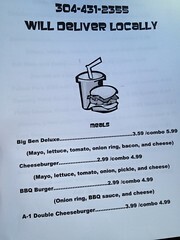 The first item I noticed was the Big Ben Deluxe with mayo, lettuce, tomato, onion ring, bacon and cheese for $3.59. I also ordered two slaw-chili-onion-mustard dogs. All the toppings are free, except the slaw, which is .25 more. I think I got a deal somehow because I only ended up paying about $6.36 and got more than I bargained for. After waiting for a good little while - it's clear they cook them as soon as you order, not before - I finally was handed a smoldering paper bag full of treats. When I was able to look in my bag, I realized that I was given not one, but two burgers. 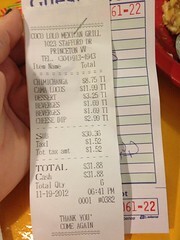 They didn't get my order wrong, because they didn't charge me extra. There was nobody else in line or even near me when ordering, so it couldn't have been anyone else's. I can only assume they decided to throw in an extra for good luck. 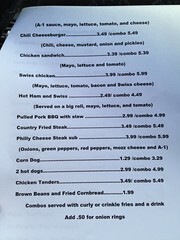 I first took a bite of the hotdog because I was really excited for it. 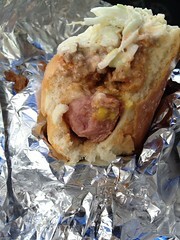 I had just had a "WV hotdog," and was hoping this would live up to the previous one. The slaw was not minced aswell as I would've liked. 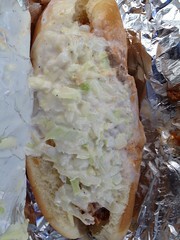 The chili didn't have that tangy sweet taste I like, but overall, it was still a good hotdog. 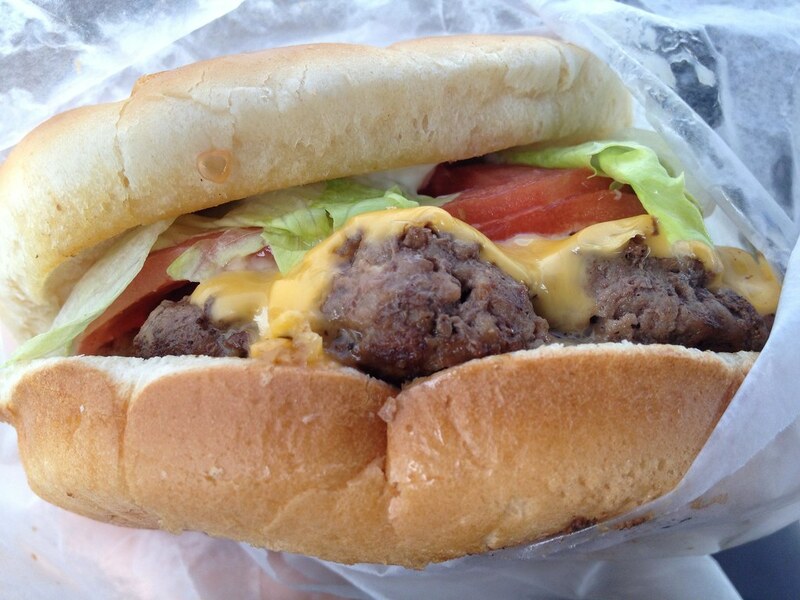 But for the real test - the burger. This guy had some girth to him, and I like how the cheese melted perfectly atop the burger. It was tasty. The crisp of the fried onion ring, cool tomato and crunch of the lettuce was great on a warm bun. The burger was seasoned well, too. Both of them! Unfortunately, my tummy didn't do so well later on that night - maybe it was the grease? So maybe I'll have to wait a bit before I try this one out again. 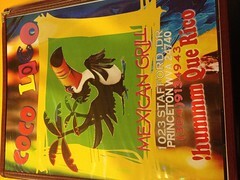 The location that was home to El Jaripeo is now Coco Loco. 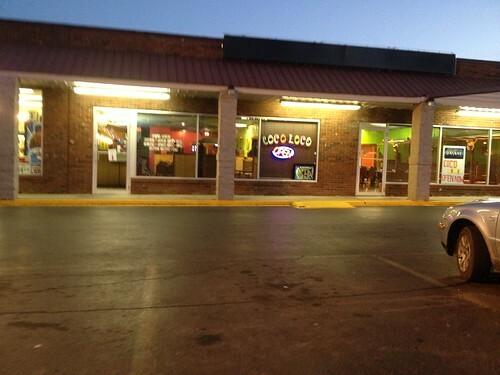 Located at 1023 Stafford Drive, this Mexican restaurant is much bigger than it appears from the outside. 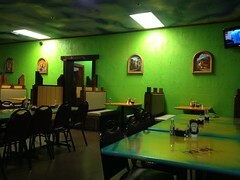 Inside, the interior looked mostly the same as El Jaripeo - even the ceiling was still painted like the sky. 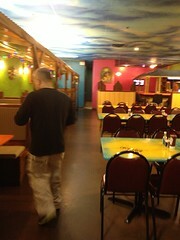 We were the only people in there to start, and it looked as though only one person was working. We got the standard salsa and chips, and I asked for some queso, too. 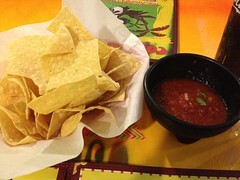 The salsa was good - still a little heavy on the cilantro, but overall decent. 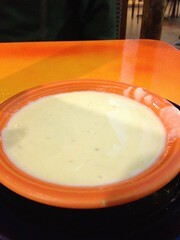 The queso was tasty, but the texture was off at times, like maybe it was cooked a little too long. 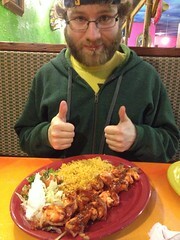 I ordered the chimichangas, and Chris got a chipotle shrimp deal. 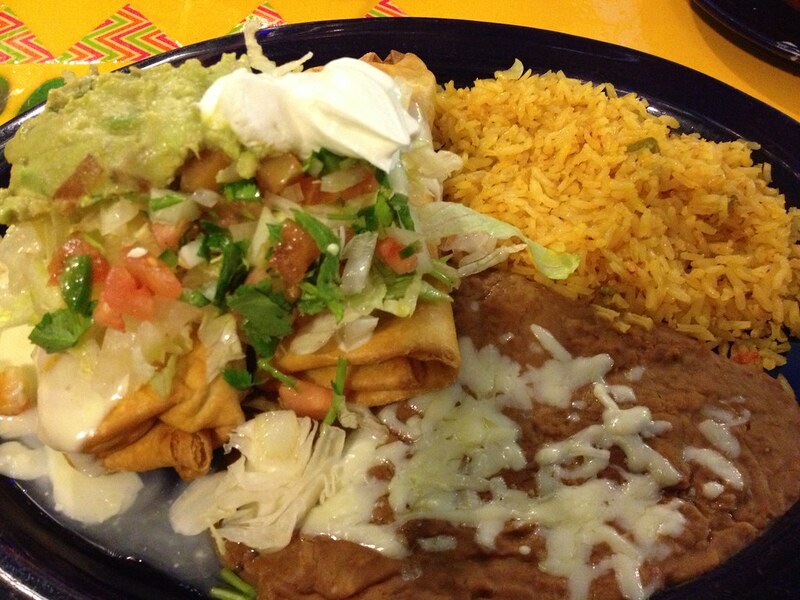 The chimichangas had a nice crunch to the tortilla, and inside was stuffed full of steak and onions. I piled some refried beans and sour cream on it and was a happy camper. Chris' wasn't up my alley. The chipotle was more like an off-BBQ taste, but I think he enjoyed it for the most part. 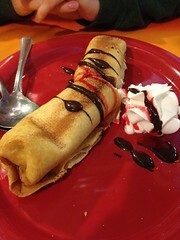 We also ordered the fried cheesecake - if you want to make a dessert even more indulgent, this is how. Pretty tasty. While we were sitting there, a customer came in for a to-go order and was praising the restaurant. 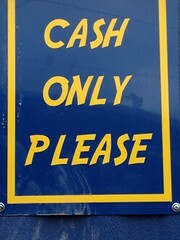 Apparently the owner has had other locations, and this customer was ecstatic that he now had one on this side of town. She was a long-time fan and convinced me to check it out again. We'll see. Tudor's Biscuit World recently opened up a second location in Morgantown - right on High Street - to cater to that late-night, drunk college student crowd - they're open until the wee hours of the morning some nights. Not too long ago, the first location graced Morgantown, much to the delight of biscuit-lovers everywhere. My blog received muuuch attention because of my not-so-great experience. And then my not-so-great redemption. BUT. Hell has frozen over. I have drunk the metaphorical kool-aid. Is it this specific location? Is it because I dined inside? So, the food was fresh, not soggy, not greasy and delicious? The downtown location is pretty small. It's at 376 High Street; there are some standing-tables as soon as you walk in and a sprawling chalkboard menu on the back wall. I think there are some specialty biscuits here. I ordered the Huggie Bear - sausage, bacon, egg and cheese. I really only got it because it was the first one on the board, so I assumed it was their special. 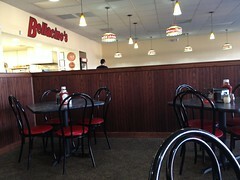 There is a narrow line of booths to the right of the ordering area. I took a seat and awaited my meal. Though they were busy, they pushed the food out pretty quickly. As soon as I unwrapped my sandwich, I realized what may have been my issue in the past. 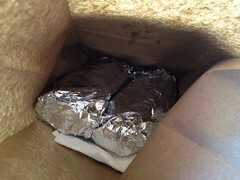 The wrapper acts as a small oven, so the longer it stays in the packaging, and the bag, it gets soggier. They key here is to eat it fresh. As soon as it is made. That makes all the difference. The biscuit was crumbly, soft, buttery. Cheese was melting atop the hot pile of meat. Good breakfast sandwich, folks. Now you can all rejoice. I did a video on a jockey at Charles Town Races for my class in WV Uncovered last semester. Coincidentally I recently heard from the folks over at Hollywood Casino at Charles Town Races, but not for my journalistic ability. For my blog. Final Cut Steakhouse in Hollywood Casino at Charles Town Races is a popular restaurant in Charles Town, and they're now bottling their 12 oz. spicy and sweet sauces for $6 each - Signature Steak Sauce, Meyer Lemon Cocktail Sauce and Herbed Ketchup. 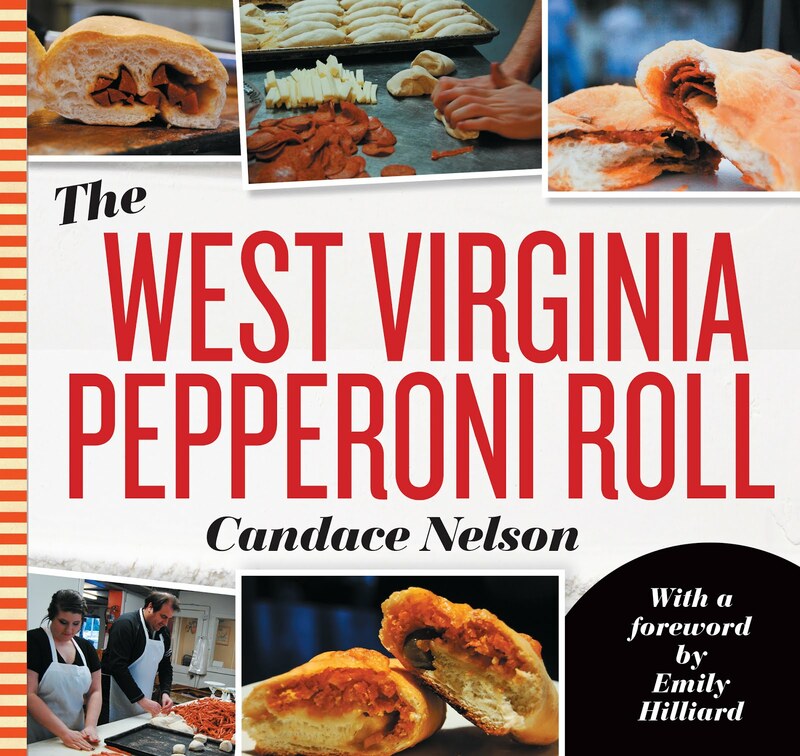 Developed by Final Cut's Executive Chef Brian Collins, the sauces are bottled in West Virginia and sole at the casino's gift shop and the hostess stand at the steakhouse. They invited me and a guest to try the sauces at a 3-course dinner at the restaurant, but, unfortunately, I'm not in that area too often. Hopefully I'll be able to check them out in the future, though. Instead, I asked if they would want to send me the three sauces just so I can test them out. They did (on the house! ), and I went to the store to pick up some steaks (for the steak sauce! ), shrimp (for the cocktail sauce!) and tater tots (for the ketchup!). Nice little surf and turf for dinner. Let me start off by saying that the steak sauce is the best I've ever had. Which may not be saying a lot because I haven't had much outside of A1, but this sauce is tangy, yet slightly sweet. Smooth, slightly peppery, but not overpowering. I feel with A1, it's just kind of bitter at times. The ratio between steak and sauce quickly weighed heavily on the latter. So. Good. The cocktail sauce is heavier on the lemon that what I'm used to, but it's still tasty. That citrus flavor is prominent, but hints of horseradish and other ingredients can be tasted, too. I tend to like a little more tomato-y. The herbed ketchup was very similar to the cocktail sauce, but with that more tomato taste that I like. I wasn't super happy about it with the tater tots, but it would be excellent on a sandwich if you wanted a little extra kick beyond typical condiments. I'll be sure to use it next time I'm looking for something a little fancier. I've talked about Slight Indul- gence, the gourmet food and wine store, on High Street before. Featuring hard-to-find goodies like fine wines, luxurious chocolates and canned veggies, this gem is the perfect place to try something new and find a new favorite. 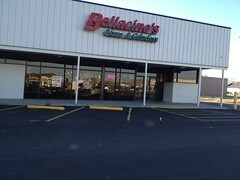 They have two locations: One on High Street, and the other is on Collins Ferry Road. The latter has a cafe portion. 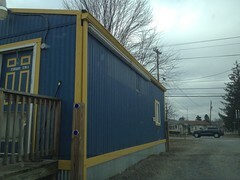 Right at the corner of Burroughs Street and Collins Ferry sits this second location. 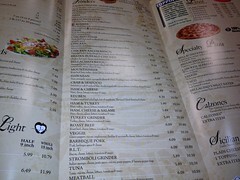 In addition to the huge store selection, they have a menu full of paninis and salads in a small cafe area. As soon as I walked in, the helpful woman behind the counter asked if I needed anything. 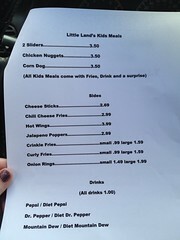 When I told her I wanted to have some lunch, she pointed me to the left wing of the building and brought out some menus. There are only a few seats on this side, but there is more dining in the back of the building. Be sure to allow yourself some time here - it's a little slow. And once, I tried to come here, and it was completely full with no tables. So, plan ahead. The panini on the menu that stood out to me was the "Prosciutto & Smoked Gouda," which had prosciutto, smoked gouda, red onion, tomatoes and fontina cheese for $9.95. You can get chips or a side salad, and I opted for that house salad, which was mixed greens, tomatoes and a balsamic/oil dressing. 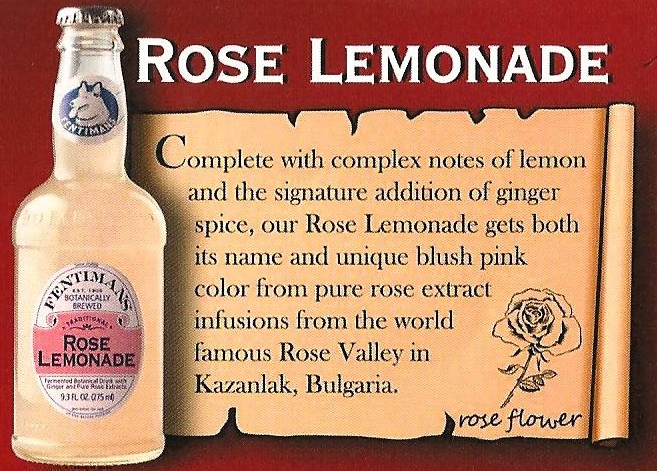 For a drink, I went with a rose lemonade - a lemonade with lemon, ginger spice, and pure rose extract. 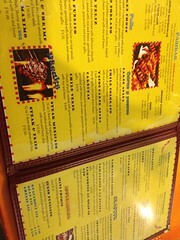 The menu is really quite nice - some different combinations, but some safe ones, too. I appreciate the creativity. When our food finally came out, it was like a little taste of summer. It was a nice day, sun shining, and the food was fresh. My sandwich was served on buttered, fluffy bread with a crisp on the outside. Inside was silky prosciutto - almost too silky. 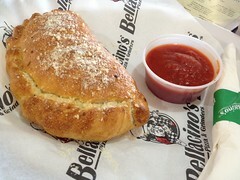 But the heavy fontina cheese and sweet onion balanced it out. It really was a nice, delicate sandwich. And the salad! For such a basic salad, it 's dynamite. I love the balsamic, and the greens were fresh from the garden. The lemonade was different, as it could almost taste perfumey at times, but it was something new. I did finish it, and by the end, I actually enjoyed it. Refreshing. On the way out, it was nearly impossible to walk by all the amazing items they had for sale and not buy anything. So, I thought, what's better than a little something sweet after dinner? Chocolate, it is. I bought this huge Neuhaus bar (for like $7 - ouch). But it was lovely - tiny specks of hard caramel in a smooth, creamy milk chocolate. Gah. Want one now. If you want to try something a little different, a little more upscale, while still casual, give Slight Indulgence a chance. See if you can make it out of there without buying something. Check out their Twitter and Facebook.